Kolor Can makes commercial grade plastic receptacles that are made in the USA. These tough receptacles are usually sold as a complete unit and an economical price. Our Kolor Can receptacles feature a lid and liner that eliminates the need for trash bags. We offer a pedestal for mounting these receptacles to prevent vandalism. Signature 42 Gallon Receptacle with 2 Way Open Lid. Signature 42 Gallon Receptacle with 2-Way Recycle Lid for Bottles & Cans. 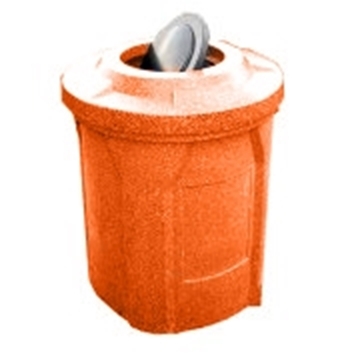 Signature 42 Gallon Receptacle with Dome Top Lid. 38lbs. Signature 42 Gallon Receptacle with Flat Bug Barrier Lid. 29lbs.